A supplemental database for customers of Business Source Premier. With daily updates, Regional Business News provides comprehensive full text for regional business publications (including titles from Crain Communications). Regional Business News has full text for more than 60 sources. At the top of the BSC web page, you'll see a blue bar with links to various items; one of these is "More." Place your cursor over "More" to bring up a pulldown menu. One of the menu options is "Company Profiles." Here, you'll find downloadable company profiles from MarketLine, a well-known and reputable purveyor of company and business data. Key information presented in MarketLine reports includes sales, employees, SWOT analyses, and primary competitors. Profiles of medical supply companies comes from MedTrack, another business intelligence company. To find news about the company in major publications, enter the name of the company in the search interface. Specify in the drop-down menu in the search interface that you're searching by "CO Company Entity." This site allows users to access the EDGAR database of corporate SEC filings, SEC news digests and public statements, current SEC rulemaking, proposals and final rules, SEC enforcement actions, etc. Value Line covers more than 1,700 companies listed on the major U.S. stock exchanges. The "Weekly summary and index" gives ratios, rankings, and price data in an alphabetical list. Detailed listings for each company are arranged in "Ratings and reports" sections, grouped by industry sectors, each introduced with an industry overview. Each also includes Value Line ratings, projections, and betas. The "Weekly selection and opinion" contains predictions about economic conditions and outlook, with profiles on recommended investments. Click on "Industry Surveys" in the menu bar at the top of the page to get to the primary search interface for industries. From here, you can search a list of over 50 in-depth S&P industry surveys. You can also do a search for an industry survey by company name, if you're unsure of the industry in which your company is classified. Mergent Intellect includes a sub-database called First Research, which includes industry profiles for over 500 industries and 1000 sub-industries. To search First Research, scroll down Mergent Intellect's webpage to find the link for First Research. The database will require a secondary login with your SCSU e-mail address. Do not use a gmail or other external e-mail address, as this will effectively block you from the database. Provides statistical information on the U.S. manufacturing sector, including data on major companies within each industry. Data includes financial ratios, employee compensation, sales, and materials consumed within each industry. Arranged by NAICS code. Industries at a Glance from the U.S. Department of Labor, Bureau of Labor Statistics. The U.S. Economic Census offers detailed statistics and information on all aspects of business and industry in the United States, including retail trade, manufacturing, and other sectors. 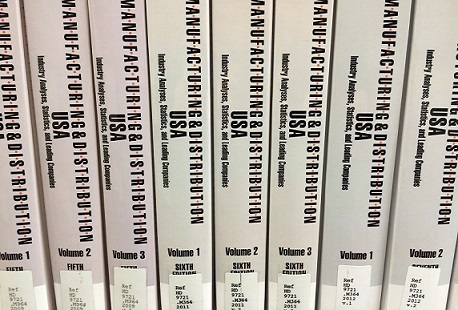 North American Industry Classification System (NAICS) has replaced the U.S. Standard Industrial Classification (SIC) system. This site includes tables to NAICS-to-SIC and SIC-to-NAICS conversion. NAICS is the key to using and understanding economic statistics collected by the U.S. Census Bureau. Place your cursor over the "For Business" tab for links to resources for starting, managing and financing a business, among other useful items.